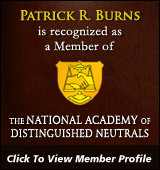 Patrick Burns focuses his practice on ADR and civil litigation. He is licensed to practice law in Minnesota, North Dakota, Wisconsin and South Dakota. 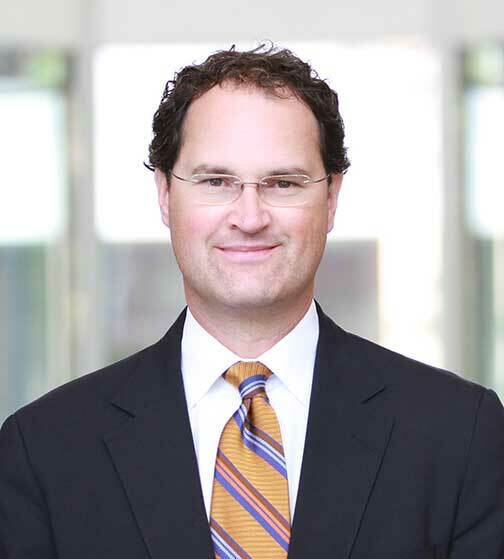 Patrick was recognized as a “2015 Minnesota Lawyer of the Year” by Minnesota Lawyer magazine. He was also recognized as a Super Lawyer for ADR and litigation in 2014,2015 and 2016 by The Twin Cities Business Journal. Minnesota Lawyer named Patrick one of 20 “Up and Coming Attorneys” in the state in 2007, and in 2010 he was named a “Rising Star” in ADR and litigation by Minnesota Law & Politics. Patrick is an active mediator and arbitrator who serves on the American Arbitration Association’s (AAA) national and international panels of mediators and arbitrators. Patrick also volunteers as a mediator through the Minneapolis Department of Civil Rights and Hennepin County District Court. He was formerly vice president of the Minneapolis office of the American Arbitration Association and served on active duty as an officer and trial lawyer in the Army JAG Corps. Patrick earned B.S., M.P.A. and J.D. degrees from the University of South Dakota, where he is an adjunct professor of law. Patrick was formerly the chair of the Minnesota State Bar Association’s 400 member Alternative Dispute Resolution Section. He recently earned an LL.M in Dispute Resolution from the Pepperdine School of Law Straus Institute for Dispute Resolution in Malibu, California. Litigation — Experience as a trial lawyer handling criminal defense, business, personal injury, franchise and employment matters in military courts, state and federal courts and in arbitration. Significant experience handling business, franchise, dealer and construction-related matters, insurance coverage disputes and personal injury claims. Clients include individuals, businesses, non-profit groups and U.S. military service members and veterans. Represents parties in mediations and arbitrations and in federal and state courts. Arbitration and Mediation — Retained and serves as a neutral for a wide range of disputes. Representative examples in the past five years include claims of breach of contracts for sales of goods and services; disputes arising from sales of businesses; disputes concerning real estate sales, leases, financing and related issues; construction disputes; partnership disputes; commercial and consumer lending disputes; civil rights violation disputes; employer-employee termination-related litigation; consumer/debtor–financing agency disputes concerning payments, defaults, security, etc. Trial Lawyer — Has tried jury and bench cases and arbitrations. Representative litigation includes corporate and partnership governance disputes; disputes concerning fraud; disputes concerning enforcement of state and federal franchise laws; litigation concerning various types of commercial contracts; unfair competition litigation; intellectual property; disputes concerning sales of businesses; negligence claims; real estate & disclosure, franchise and dealership litigation; disputes concerning real estate sales and leases; employment disputes; insurance coverage disputes, etc…. Master of Laws (LL.M) in Dispute Resolution from the perennially number-one ranked law school for dispute resolution in the United States — Pepperdine University School of Law. Additional coursework at Hamline University School of Law. Patrick was recognized a “2015 Minnesota Lawyer of the Year” by Minnesota Lawyer magazine. The Minnesota ADR Handbook Seminar (“Resolving Ethical Dilemmas in ADR”), Minnesota CLE, Minneapolis, Minnesota, April 26, 2011.
International Mediation Institute (IMI) Certified Mediator. Active in establishing pro bono mediation program in Hennepin County. Appointed as mediator by Hennepin County District Court in numerous pro bono matters; named a 2015 “Attorney of the Year” by Minnesota Lawyer magazine for pro bono efforts on behalf of a Vietnam War combat veteran in appeals to the Veteran’s Administration and Army Board for Correction of Military Records; mediator for the Minneapolis Department of Civil Rights; represents Minnesota GreenStar, the leading third-party certifier of green building, remodeling and design in the State of Minnesota. Willing to travel locally, statewide, nationally and internationally to offer ADR services. Represents clients nationally.